Now that the Internet is relatively accessible again, I’ve been gradually posting the entries that had been accumulating during the Internet lull. There are still a couple more of those, but it seems like a progress report is in order! I am writing this in Mackerel Cove, on the north side of Swans Island. 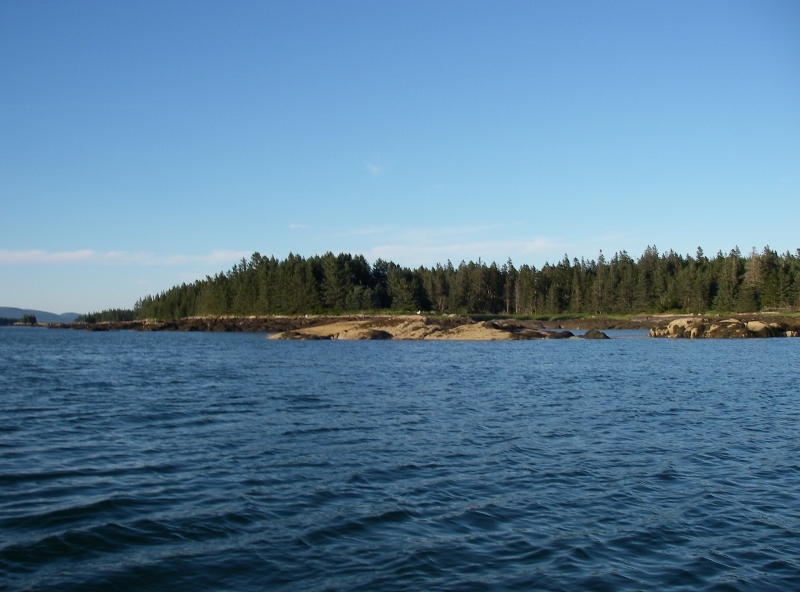 Swans Island is a big one, alongside the open sea, within nearby sight of Acadia National Park. A couple of days ago I went into Burnt Coat Harbor, on the south end of Swans Island, and had the great pleasure of visiting with Bill Cheney. A lot of south wind was forecast for the upcoming days, with rain and thunderstorms, so Bill’s end of the harbor – the north end of a harbor on the south side of the island – didn’t seem like such a good spot to settle. After a peaceful night and that lovely morning visit, when the breeze started to come up around noon I headed off. Swans Island is very, very beautiful. Rocks, trees, and I was surprised to find on the west side, a perfect white sandy beach, with small dunes and green salt grass growing on the top – like something you’d see on Cape Cod – tucked in between all the pink granite that comes out from the shore at either end of the beach. And the fir trees growing down almost to the high tide line. Continuing around the northwest corner of the island there are more coves, gradually more sheltered from the south and west. I spent one night in Buckle Harbor, hugely enjoying the peacefulness after all the flurry of lobster boats and the big annual folk festival in Burnt Coat Harbor. The south wind was beginning though, and although perfectly safe, I wasn’t wild about how directly the wind fed across the low land and stretch of shallow water to my spot. It wasn’t going to be so fun when that wind picked up another few notches. I debated right up until the last second where a turn was required for the harbor option. Complicating the question was that I had a once every three weeks phone meeting due to take place at 5:30 that evening. And phone connections are not guaranteed in every nice harbor. Never mind nice protection from the upcoming weather. It was a real shame to pass up that lovely wind – the autopilot hates it when the wind is off the stern, which it will be when this weather clears out, and it was so perfectly, easily content with how things were going. And being rained on is no reason not to go sailing. But all in all, with the balance of everything, it was probably the best choice to go in. It took another hour to tack into the south end of Mackerel Cove, and for a while the breeze half died, reminding me for the zillionth time that sailing and schedules are not a good combination. As it turned out, after the boat was anchored and settled and various chores taken care of, the rain began and I fell sound asleep for a good couple hours. So I guess a little rest was in order, rather than sailing all day! Now, the next day, it’s blowing about 15 knots in the harbor (more rain, and thunderstorms), and I’m quite delighted to be tucked in here. Anchoring plan A didn’t work out, in the bight along the west side of Mackerel Cove – 11 (ELEVEN!) other boats had had the same idea about the weather and that spot – but I saw a couple of masts farther down, and as it turns out the next little cove around the corner is just perfect. Hills with trees to the south, and the bottom sloping enough that I was able to get reasonably close to the shore. And a phone connection, and that connection strong enough to support the Internet gizmo. And then for an extra treat, a visit from one of Bill’s friends, who recognized the boat and rowed out in his dinghy to say hello. All pretty nice! Tomorrow the weather is forecast to clear out, with a west wind of 10 to 15 knots, so I expect I’ll be off. It’ll be fun to see the mountains in Acadia come out of the clouds. Having heard much about Auklet and her intrepid skipper from Bill Cheney, it was a great pleasure to welcome them to Mackerel Cove.